I can bet permanent marker was never on your travel check list. It wasn’t on mine either as usually I am traveling solo or only with couple friends. But in recent years I was on couple group tours and after these trips permanent marker become must to have. Why do you need it? Let’s say you are on bus tour. Everybody are buying the same kind of water bottles and if you won’t keep your bottle in the hands all the time after awhile you’ll can find which one is yours. 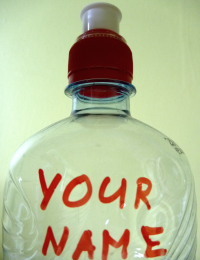 All you need the simple permanent marker and write your name on the bottle. The same can be done with all belongings which are not unique in the group and can be lost. I was started to use in hostels for marking food I was leaving in the kitchen. As post-it notes I used before usually get lost. So buy simple permanent marker which cost less then buck but it makes your travel belongings so much more organized. Never thought about bringing on. Could be a very useful addition, it doesn’t really take up any space, and they are cheap as well.